CoffeeWastedMomma: Toddlers in the kitchen?....It can and should be done! WIP Wednesday! 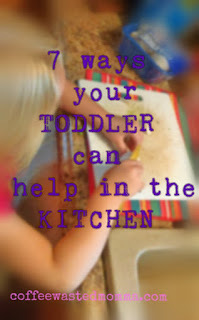 Toddlers in the kitchen?....It can and should be done! WIP Wednesday! I really feel this is so important. I'm a strong believer that toddlers are the most impressionable creatures and we need to use it to our advantage! I know from experience, this can cause them to yell repeatedly from another room until you leave the kitchen to find them and what they want! I know, I'm guilty myself. We get tired, in a hurry, try to just get one meal finished without interruption, chaos and multi-tasking! And that is totally okay!! I'm not saying they have to be attached to your hip for every single meal prep or underfoot for every detail of the meal. Find a time, meal and area that works for everyone. Prep work is a GREAT place to start with the littles! If we really think about all that we put into each meal we fix for our families, we can find tons of little ways to get our kids involved. Teach them from the beginning how we decide,find a recipe, grocery list, shop, prepare or store the food, gather ingredients, pots, pans, etc. Think about it!...All this before we even get cooking! These are great ways to teach our kids soooo many lessons. Okay, sorry, I've gotten a bit off topic. 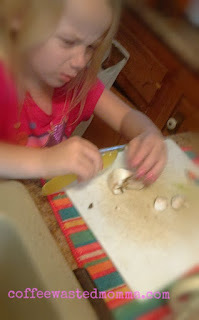 I wanted to share a few ways I have introduced my toddler to the kitchen and how I let her help out. What veggies will we have tonight? How many potatoes will we need for 5 people? Kids love being included in the decision making. They feel like their opinions matter(as they should). They like to feel important, just like you! Do you have a garden? Let them be a part of it! Can you bring me a big spoon, whisk, bowl...? They want to be and feel helpful. Can you find the green peppers? Let them show off what they know! Identifying is huge for toddlers! This is important for you, them and the produce they will be handling! Show them the proper way to wash their hands and any food they are helping prepare. Get them their own scrubby brush. They will feel this is "their job" and be more willing if it is something you have entrusted them to do. Obviously with supervision and caution! I'm NOT saying turn your three year old loose with a meat cleaver! Why is the potato "bumpy"? Can you smell the onion? What does the carrot taste like raw? Peeling oranges by herself is HUGE in this house! She knows she can do it...and she DOES! This is the part where they start seeing what this is going to be or what they are making. Explain why we put A with B or why we need to "dump" everything together. With veggies, let them see the different colors going into the dish. Can you name all the veggies we've used? What colors do you see in our food? This is should be the easy and funnest part! What kid doesn't want to shake things up? Sprinkle a little LOT of cheese in the mix! How many spices did we use? How much cheese does it need? Does it go on top of the dish or mixed in? They love to be hopped up on the counter top and given a wooden spoon or whisk! I don't know why every kid I have ever met thinks this is the best part EVER of cooking or baking! Just go with it Momma! Let them stir, stir, stir their little hearts out! What are you WIPping up today?